Overview: What is Path Forward 2045? The Long Range Transportation Plan is a multi-modal plan for our region. It outlines our region’s long-range transportation vision; it also considers all future projects that our region anticipates to manage today, 2030 and 2045. We must work together to create a plan that advances our region with innovation to enhance mobility. 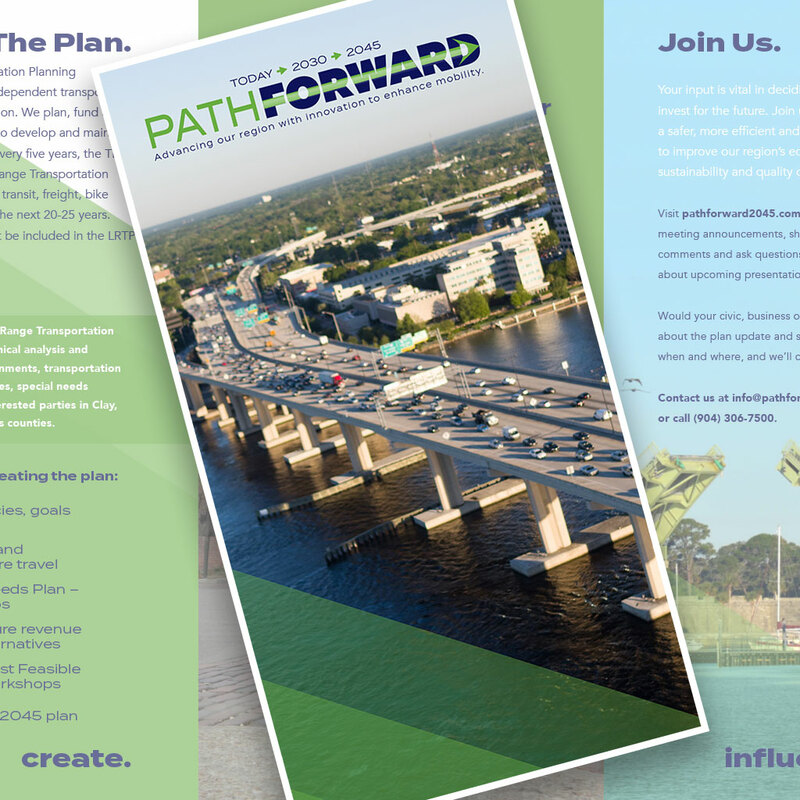 The 2045 Long Range Transportation Plan details how the North Florida transportation system will evolve over the next 25 years. A Long Range Transportation Plan (LRTP) is a strategy of capital improvement programming developed to guide the investment of public funds in transportation facilities. The LRTP provides the blueprint from which the Transportation Improvement Plan (TIP) is developed. The TIP identifies the highway, transit, bike way and pedestrian projects scheduled to be constructed over a five-year time frame. What is a Transportation Management Area (TMA)? A Transportation Management Area (TMA) is an area designated by the Secretary of Transportation, having an urbanized area population of over 200,000, or upon special request from the Governor and the TPO designated for the area. What is a Transportation Planning Organization (TPO) and what is its role in the planning process? The TPO is the forum for cooperative transportation decision making for the metropolitan planning area. The TPO members are representatives of the local units of government. An TPO is required in each urbanized area having a population of over 50,000. There are currently 340 TPOs in the United States and 27 in Florida. These TPOs, in cooperation with states, transit operators, local municipalities, counties, and other key transportation entities in the metropolitan area carry out the planning process. These same agencies, under the coordination of the TPO, also cooperatively develop the annual Unified Planning Work Program (UPWP) and the 3-year Transportation Improvement Program (TIP). Where do TPOs and states get the money for long-range transportation planning? The TEA-21 legislation guarantees $198 billion in surface transportation investment. Surface transportation funds have been reauthorized every 6 years, in the past, and should be reauthorized again in 2003. These funds are allocated through programs like the National Highway System (NHS), the Surface Transportation Program (STP), and the Congestion Mitigation and Air Quality Improvement Program (CMAQ), before being redirected to states. TEA-21 also provides planning funds for states and TPOs, called State Planning and Research Funds and Planning Funds respectively. The actual money for Federal transportation funding comes from the Federal excise tax on gasoline, which is collected by each State government and turned over to the Federal Highway Trust Fund, the primary source of Federal transportation funds. States also generate their own funds for transportation projects through a variety of means. What topics must a long range transportation plan include? Documents conclusions and decisions of the planning process. Includes long-term and short-term policies, strategies, and actions. Covers both capital projects and operation strategies. Includes preservation of the existing system, system expansion and operation. Addresses the movement of both people and goods. Common issues addressed in long-range transportation plans may include air quality, asset management, conformity (integrating transportation and air quality planning into areas designated by the EPA), economic development, environmental justice, financial planning and programming, freight movement, Intelligent Transportation Systems, performance measures, safety, smart growth, and system management (to name a few). What is public involvement and why is it important to long-range transportation planning? Informs people through outreach and participation (including people who are under served by transportation). Involves people “face to face” through meetings. Uses special techniques to enhance participation. For long-range transportation planning, public involvement is important to help articulate the community’s/state’s vision and goals, provide the public with the opportunity to champion a variety of transportation interests, and receive valuable input into the planning process. For transportation planning, public involvement can include regional agencies, local government, user/special interest groups, tribal governments, and states, as well as the private sector, legal system, and Federal government. This plan includes all modes of transportation. Short- and long-term recommendations will be made for motor vehicle, bicycle, pedestrian, transit, and freight. Will local transportation, port and airport authorities be involved? What role will transit play? Why is this a 25 year plan? The Federal Government requires urbanized regions to plan for a 25 year horizon. This is to encourage long term planning for funding and quality of life issues. Air quality conformity, sustainability and safety are key reasons to undertake this effort. Does my survey really count? Yes! Survey results will guide the evaluation to select projects and programs to be included in the 2045 LRTP. This includes deciding how much money is spent for each category of transportation improvements and where those improvements occur. How do we fund transportation projects? First identify transportation improvement projects in the LRTP. All projects go into a 5 year Transportation Improvement Program (TIP). All transit projects are entered into a 10 year Transit Development Plan (TDP). Any of these projects can then be identified for local, regional, state, and federal funding sources. In order for future transportation projects in the Metropolitan Planning Area to be eligible for state or federal funding, they must be a part of the adopted Long-Range Transportation Plan. Updating the plan gives the North Florida TPO an opportunity to revisit its needs and priorities for future transportation system investments. This plan will also address new federal guidance and current goals and objectives. This plan also can influence transportation policy in the region including what types of projects will be pursued and will be instrumental in supporting the area’s growth. What does the LRTP include and not include? The LRTP includes a study of roadway, bicycle, pedestrian, and transit improvements to be incorporated within the North Florida TPO area for the next 20-25 years. The LRTP does not include concerns such as: Traffic Signal Timing, Parking Regulations, Street Maintenance and Repair, or Parks and Recreational Areas. How can I make transportation-related suggestions regarding what the county should be planning and prioritizing? The North Florida TPO plans, funds and mobilizes resources needed to develop and maintain our transportation system.